Most of the students who read this article would have already done many essays, homework and writing activities with a text processor such as Microsoft Office’s Word or Writer, its open source in LibreOffice. In this article, an alternative program used by mathematicians and professional scientist is going to be shown. LaTeX is a high-quality text compiling system created from its beginnings to create scientifical articles. Nowadays it is extensively used in faculties related to mathematics or computer science by its usefulness to generate papers full of beautifully-exposed equations and mathematical symbols. It is kind of a high-quality standard in professional science. LaTeX works as document preparation system that interprets code orders and produces the result by compiling a document. Those different code lines specify to the program every single aspect of the document that needs to be controlled, resulting in an optimal and precise paper in terms of quality. Not by casualty, many curriculum vitae are made in the academia by compilation with LaTeX. Also, it can be used to produce books, magazines, etc. producing in all of them an excellent result. Why should I be interested in LaTeX? 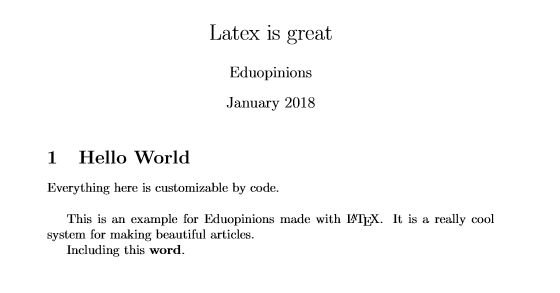 If you usually write articles and you want them to be published with a high-quality editing LaTeX is your friend. Simply compare any pdf created with Word or similar programs: the typography, edition quality or adjustment between paragraphs, it is just way better in LaTeX. But, there is a great caveat in this presentation, to use the program you have to understand how their code language works and until you overcome the learning curve, it can be really difficult and tedious. Before starting to write you have to write some code lines to determine the page format. But the important thing here is the simplicity of the writing once the page is prepared. You don’t need to use your mouse to adjust every title. Simply, with the command \title, you get a title with the proper style. In the same vein, you can easily introduce graphics, equation or whatever you want. The MiKTeX Package, which includes LaTeX and the TexMaker editor. Ideal to begin with. The TexLive suite, way more complete. It has everything you will need to create any type of paper. What If I don’t like to code? If you finally do not want to spend some time learning the LaTeX language and you just want to focus on writing, there is a solution for you. Some people have thought about your needs and they have created Lyx. Lyx is an editor and compiler that uses LaTeX but allows you to see directly the result as when you use Word. Simply install it an start writing. Political Scientist in transition to Economics. He believes that social sciences can be 'hard' sciences, as well. Although he has not yet get to live from studying, he is not willing to stop trying it.